We must return to our ancestral lands and live in the traditional manner. I made a big rough basket out of branches from a fallen spruce and tied a piece of nylon cloth over the top. 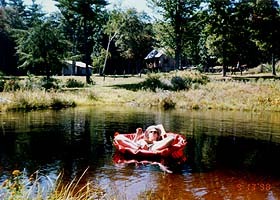 Floated around in the pond. The little trout were curious and schooled around me. Laura test-piloting at the highspeed boatbuilding demonstration. 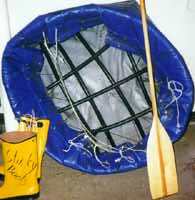 This coracle is made from the basket part of a papasan chair with an armysurplus poncho tied over it by the corners. Estimated construction time: One minute. Marilyn and Jamie engaged in stability tests. Note the model of a "tensegrity" skinboat in foreground. 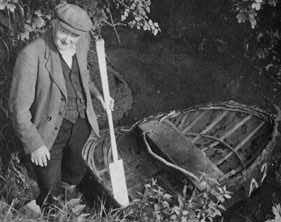 "British Coracles and Irish Currachs" by James Hornell is an excellent book on the subject.